In 1905 Gottfried Merzbacher, a geologist, published an account of two years exploring the Tian-Shan. The Central Tian-Shan Mountains, 1902-1903 (John Murray, London) is an engaging read, partly because of Merzbacher’s insights about the landscape, and descriptions of the people he meets, but also because it is an account of his efforts to solve the puzzle of where the prominent mountain of Khan Tengri actually was. This 7000m peak was readily visible from lowlands outside the Tian-Shan, but previous mappers had merely been able to theorize about how one might get to its base. It’s a shame. Hopefully someone who owns the book will post a good scan of the complete map one day. What fascinates me about these exploration accounts is the question How would we follow his route today? To that end I’ve begun mapping Merzbacher’s travels as described in The Central Tian-Shan Mountains. So far I’ve mapped Chapter 1. The key decision in this kind of mapping is what base map to use. Use a period base map (something from around 1900) and you may not be able to follow it today: place names change, roads move, and mountains get mapped more precisely. (See my previous post on the yet-moving location of Khan Tengri.) Use a modern map and you lose the sense of travel in an era of inaccurate mapping. I tend more to the modern map. To me, the question Where did he go? means Where was his route relative to modern landmarks? But many modern base maps are unsuitable. Most online mapping services do not label rivers or mountain ranges. A modern road map (like Freytag+Berndt’s Central Asia) is too small-scale (1:1,750,000) to see what’s going on. 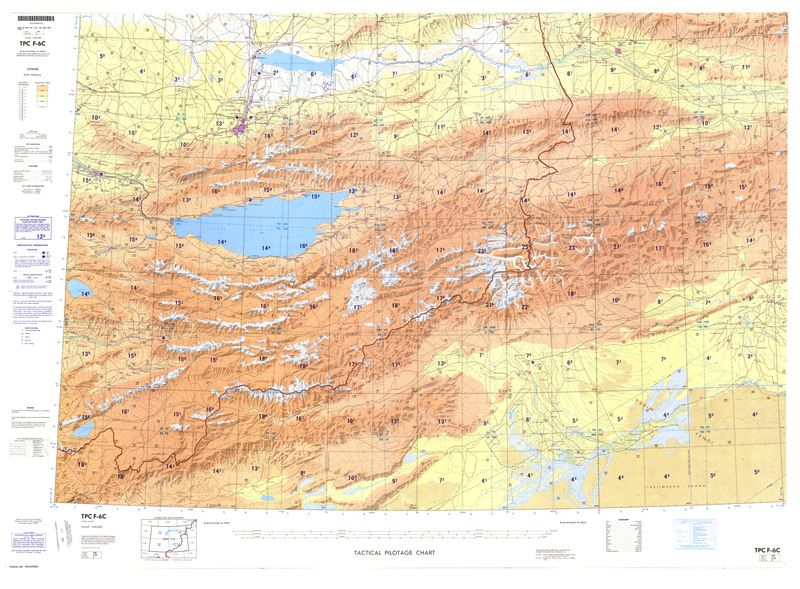 So in this case I settled for a 1980s aeronautical chart (Tactical Pilotage Chart F-6C) which gives shaded relief at a reasonable scale (1:500,000) plus the added benefit of named rivers and mountain ranges. It ain’t that pretty though.